Okay, so it wasn't all dino-themed, but there were dinosaurs and cats and eskimo kisses, so obviously it was pretty rad! Jenny + Jason met while working at Best Buy/Geek Squad. After several weeks of not quite knowing whether or not they were flirting, they both figured it out when Jason asked Jenny to go with him to GenCon (a board game convention in Indianapolis, IN). From there, they were pretty much on the same page about that whole flirting business, and 6 years later, Jason proposed to Jenny at GenCon (they go every year) and she obviously said yes! 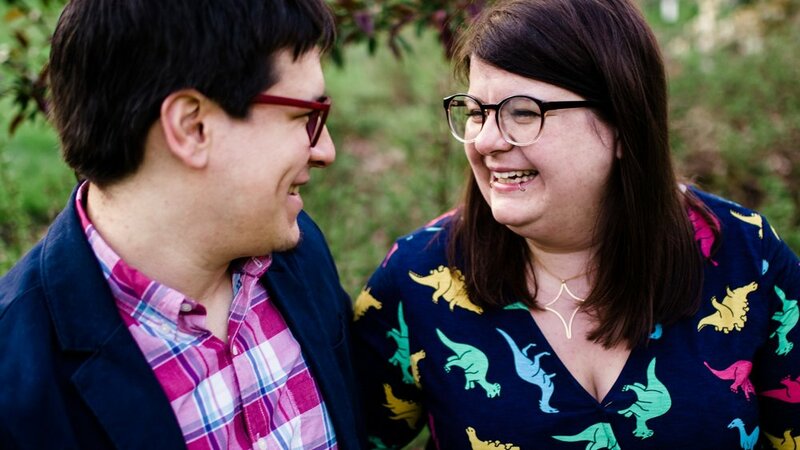 Besides loving all things board-game related, Jenny also shared with me when we met for the first time that she was thinking of themes for their wedding, and 'Elegant, Classy, but with Dinosaurs' sprang to mind, and I was instantly sold! I love a good dinosaur-themed event and I love weddings, so clearly I cannot wait for theirs! Jenny + Jason are so laid-back and fun to be around! 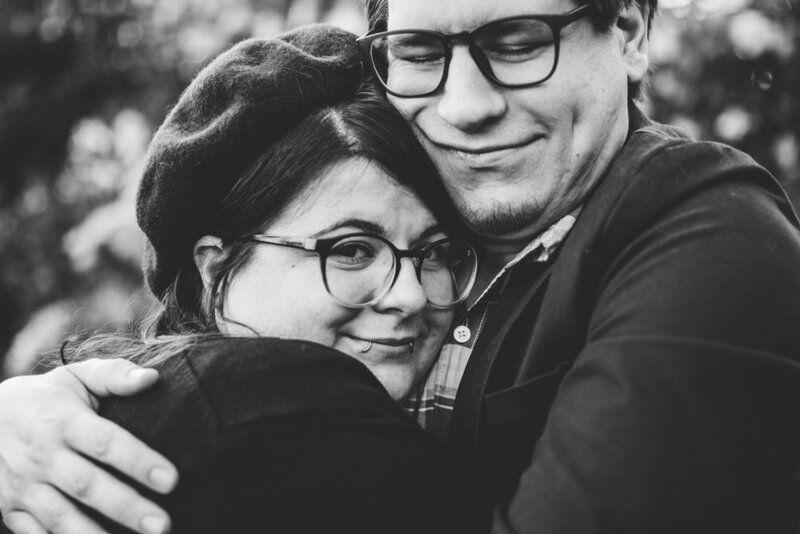 They love cider, board games, and their cats (who made a special guest appearance, however reluctantly, in these engagement photos). So without further delay, here are the photos from this super fun engagement session! Kim + Peter have family portraits taken with their kiddo, Alex, every year, but this year is a little different, and somewhat bittersweet. They recently received some bad health news about their puppy, Hunter. He likely won't be around too much longer, and Kim + Peter wanted to make sure that they were able to get in family portraits earlier than they normally would, so they could have the whole family together in photos. We met at Governor Nelson State Park for the early Fall portraits, and wandered around the park to different locations, playing games with Alex, giving treats to Hunter, and generally having a good time, even though the reason for the session was sad. Hunter is such a sweet dog, and I know his family loves him and is going to make his limited time as wonderful as it can be. I'm so glad they have time to say goodbye, and have portraits of all four of them together as a family! Ashley and I have been friends since 5th grade. We went to school together, had sleepovers and sing-a-longs at her parent's house, and I threw a minimum of 2 birthday parties at her place (thanks to Ashley's mom, Kim!) because they had a pool. In high school, we both had the opportunity to go to the Miami Valley Career Technology Center, for Commercial Art, where we spent our Junior & Senior years of high school primarily focused on graphic design and drawing skills, taking a rotation in Commercial Photography and Commercial Printing. We both graduated, and Ashley moved to the University of Cincinnati to continue her study in Graphic Design, and right around the time she moved back up to Dayton, Ohio, I was moving to Madison, WI. We've kept in touch over the years, but it can be hard when you don't live close to someone. I've been trying to get her to visit Wisconsin for the past few years (because I think Madison is awesome), and she and her husband finally rented an AirBnB and drove on up. Ashley couldn't partake of some of the best beer in the country, since she and Dustin are expecting, but they both got to explore the Madison and Stoughton areas, and we took their (very) belated engagement photos in downtown Stoughton, along with their puppies, and in the yard of the house they were renting. Thankfully, both Ashley + Dustin survived the onslaught of mosquitos that are par for the course with golden hour on a Wisconsin Summer day! While they were here, we visited Victory Cafe (for waffles and paninis, and damn good coffee), the Henry Vilas Zoo (Madison staple), the Roman Candle, and Tex Tubb's Taco Palace (no one could escape visiting Madison for the first time without eating tacos with me!) It was great to catch up, and to see her so happy. I actually teared up while I was editing photos and I am super excited to share some with you all. Cheers to a good friend, who I'm wishing all the happiness in the world. Love you, lady! Okay, so I probably spent a good 20 or 25 minutes staring at a blank page, wondering what the heck I was going to write about for today's post. Let's face it, sometimes we're inspired, and sometimes... not so much. Today is a not so much day. After that miraculous Cubs game, and the complete lack of sleep that followed it, I'm a little tired. So, I figured no one would begrudge me trying to gain some inspiration by checking in with the internet for what the internet does best... cute animal videos! But wouldn't you know it, while I was looking at all the cute animal videos (you know, for research), I realized that we've got a ton of cute animal photos ourselves, because we tend to get some non-human guests at weddings who are just too cute not to take photos of! So in honor of 'too-tired-to-adult' Friday, here are some of our favorite cute wedding animal pics!